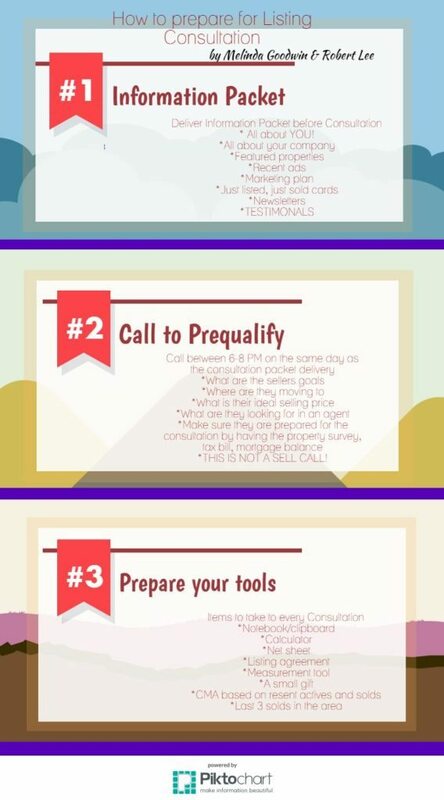 I always do a listing presentation (consultation) in three steps. Step one is a preconsultation. This allows me to brag a little about me, my agency and our production. It’s a great opportunity for my future clients to explore on their own time without pressure. A preconsult packet is an opportunity for clients to explore on their time sans pressure. During the second-step phone call (prequalification), it is important to refer to your preconsultation packet. “Seller, did you get a chance to look over that preconsultation packet I sent you? Do you have any questions?” Then, I get into the wants and desires of the client. The final step is preparing your tools. I have a consultation basket I take with me. It has all my essentials right at my finger tips. These are my tried-and-true tips, and I hope that they will help you, too. Stay tuned next week for a follow-up infographic on the consultation itself. Melinda Goodwin is Luxury Home Division director with Re/Max First Realty in St. George, Utah. Follow her on Twitter or Facebook.